What is free market? A very straightforward definition of free market is – a market system where prices of goods and services are set freely by consent of sellers and consumers. In very simple words – I have an apartment and want to sell it – I quote (asking rate) price of USD 100,000. If a buyer or buyers are willing to buy the apartment at my asking rate that can be put as the market rate for similar kind of apartments in that given area. In the same simple language if no one comes forward to buy the apartment at USD 100,000 I may decide to reduce price to say USD 80,000. So on and so forth. The logic can work in reverse direction as well If there are more than one buyer I may increase my asking rate to sat USD 125,000. This concept of free market introduces a very interesting and important Basic Economics principle of “Demand and Supply”. If demand is more compared to supply prices may go up and vice versa. However, I have been asking a question to myself and have this to many educated economists or free market experts. Have you ever questioned the same logic of demand supply and free market in scenario of Mumbai reality? Have you not wondered about hoarding? How often the free market is really a free market? Tell me how many projects in Mumbai are stalled by construction companies because of lack of funds? How many projects have been almost complete but have unsold apartments? How many projects are rescheduled for possession date/month/year? How many properties are unsold? Are we really talking about free market? Or is it really a created bubble of price. These questions roll on to the question of leaking Govt. In free market we speak about Government’s role of regulation. 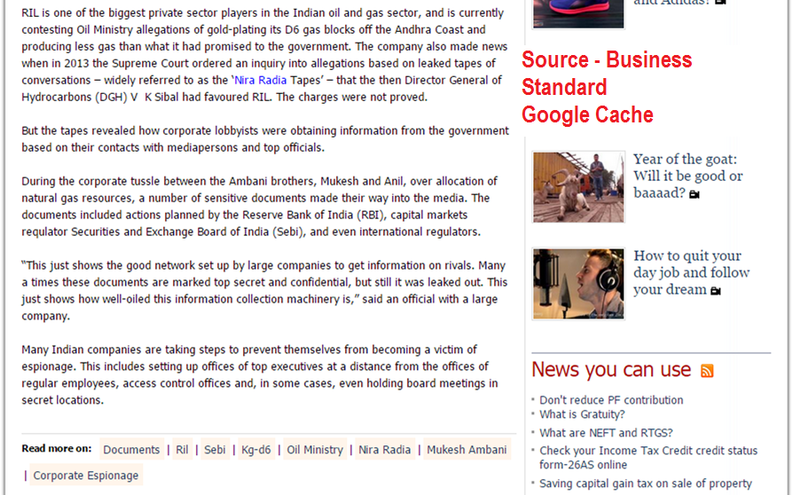 Have you heard of crony capitalism or the recent corporate espionage case in India. In one online news it was stated that many CEOs say that there is nothing new with corporate espionage. 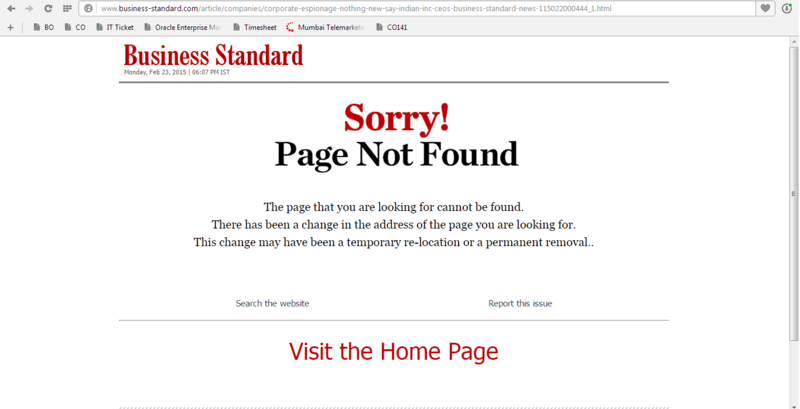 The article was published in Business Standard but that has been removed by the company now! Check the screenshots attached. I rememberr this Hindi idiom when Govt is not functioning or driven by the private businesses instead of public good. जब बागड़ ही बाग खाने लगे तो बगिया का क्या होगा?